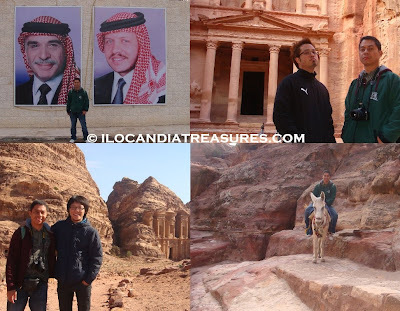 Immediately a day after arriving in Amman, I traveled for three hours to the ancient city of Petra with a newfound Japanese friend, Taesin Kim. I met him at the hostel in Amman. We had a separate accommodation. After checking in at my hotel in Petra I met American Mark Soni staying in the same hotel. We went together to main archeological site in Petra. It was drizzling that time when we started to trek the area. We walked through a narrow passage called Siq or the shaft and we were so amazed with the beautiful sceneries. At the end of the gorge is an elaborate ruin known as the Treasury. It was breathtaking. Incredible. I took many pictures of it. As soon as we ended our photo ops at the Treasury it rained cats and dogs. People were shouting that water was coming down. I did not care at first until I saw the water really flashing down to the Treasury. We were taken out of the area on a pick up car. We boarded in at the back then the car went through the dark narrow gorge with the gushing water. We met on board Jon Bach from Sweden who got so wet and even his SLR camera because he shot the happening. It was an exciting ride. It was good that I was able to take a video of it. It was like an Indiana Jones adventure. It was a rare experience that not everybody gets it. 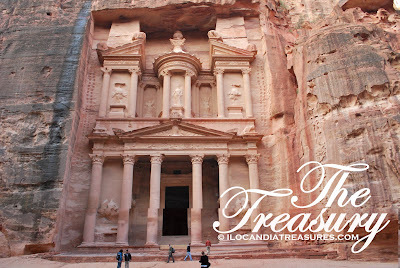 Petra is one of the Seven Wonders of the World built in 1200 BC. It is a UNESCO World Heritage Site since 1985 describing it as "one of the most precious cultural properties of man's cultural heritage." This is where Jordan originated from the domain of the kingdom of the Nabateans, the ancient Semitic people. It is considered rose-red city because of the red rock cut architecture that are seen all over the place. This is also made of water conduit system that controls the frequent flash floods which I had witnessed during my visit. This system has helped in storing water for prolonged period of drought seasons. On the following day, we went back and walked again. We saw the massive theater after the Treasury. Another ruin as equally beautiful like the Treasury is the Monastery. We took tea to drink in the store infront of it. We took time to enjoy the amazing sight until we resume walking. We saw some Bedouins who offered us to ride in a donkey. I was hesitant but when Mark approved of it then I joined him and rented another donkey for 5 JOD. I was amazed to ride with it because it can step up the ladder and even walk in the ridges. After coming from the grand canyon view, Mark has to ride in a donkey again and left me behind because he has to rush for his travel to Aqaba. So I just walked alone and took the time to take some photos with the camels and other interesting spots. It was really exhausting even it’s a little colder. The sun was up brightly. Nevertheless it was so wonderful and to see another Wonder of the World. Its really worth the walking. There was an available bus that I took just outside the gate and we left for Amman at 4pm. I met Chinese youngsters on the same bus who went with the same hostel with me back in Amman.